Many owners we know like to take their canine companion with them when they embark on a journey – whether it’s a road trip across the country, or just a family visit. The apparently simple task of getting your dog from A to B isn’t always that easy, though. It’s one thing to move a dog around safely in a car, but another thing entirely when motorcycles come into play. Although a motorcycle will never offer as much protection as a car, you can keep your dog safe – as long as you keep riding carefully – with a motorcycle dog carrier. 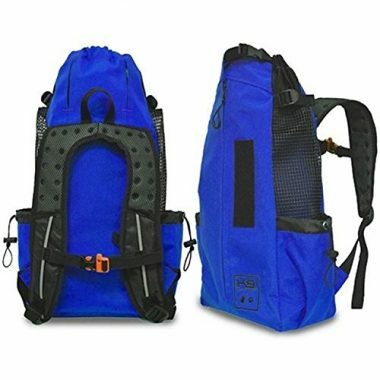 These carries are worn either on your front, or as a backpack, and keep pets secure during the ride. With these ingenious carries, you no longer have to choose between keeping your pooch safe and hitting the open road. We’ve scoured the market for our top ten motorbike dog carriers, so you can make an informed decision for the safety of both you and your dog. We’ve also addressed some common concerns about carrying your dog this way, so you can ensure your pooch can travel securely and happily. Outward Hound has earned themselves the first spot on our list with their patented PoochPouch. The carrier can be worn on your front and comes in a variety of sizes to ensure that all small to medium dogs can sit comfortably. The light-weight mesh fabric also allows your dog to stay cool on the move – much better than being stuck in a hot car on a warm day! The carrier also has an extra pocket to stow away any essentials, whether that be a collapsible water bowl or doggie treats. 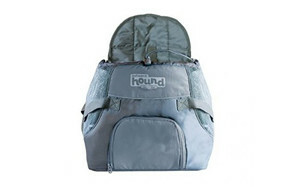 More importantly, the bag also includes an internal safety harness, keeping your pet secure even on bumpy journeys. The tough but soft nylon also makes this carrier extremely durable, so your dog can keep safe on the road for years to come. PETS GO2 offer a versatile carrier – it’s not wearable, but does offer more room for accessories than many of its backpack-style counterparts. Pets weighing up to around 20 pounds can ride comfortably in this carrier, which can expand to give larger animals a little more room. Mesh sides to ensure proper ventilation, so your pet won’t become overheated on longer trips. It’s also designed to absorb the impact of bumps, giving your furry friend as smooth a ride as possible. The padded shoulder strap makes ensures that owners are just as comfortable as pets when using this device. This carrier is airline approved, too, so can keep your dog safe in the sky as well as on the ground. 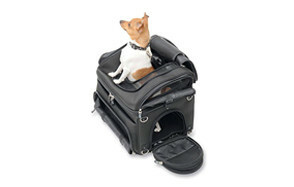 Odie Tom’s airline approved pet carrier is a great way for smaller dogs to ride safely on your motorcycle. Its waterproof material will keep pooches warm and dry on those drizzly days, whilst still being breathable to help prevent those doggie smells. 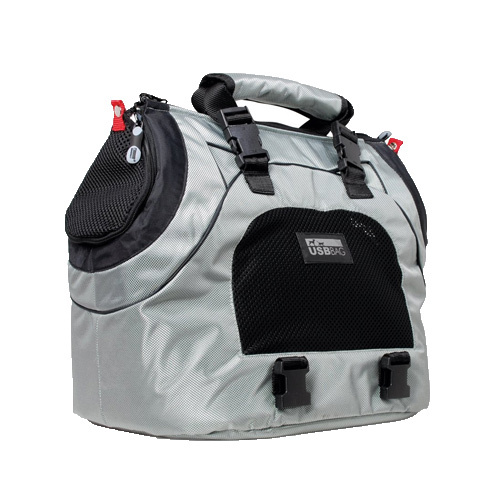 The carrier’s padded handle and lightweight design also make it comfortable for owners as well as pets. It’s perfect for travel – be it by plane, train, car, or bike – thanks to its expandable sides and airline approved size. Finally, the carrier is made from eco-friendly and totally non-toxic materials, preventing anxious chewers from doing themselves any harm. And the second backpack style carrier to make it onto our list is from Nicrew. Their carrier is adjustable, allowing pooches of all shapes and sizes to travel in comfort. It comes in a variety of sizes, from small to extra-large, and will fit most small to medium sized dogs. Customers report that dogs weighing up to 20 pounds or so can be safely carried with this device. 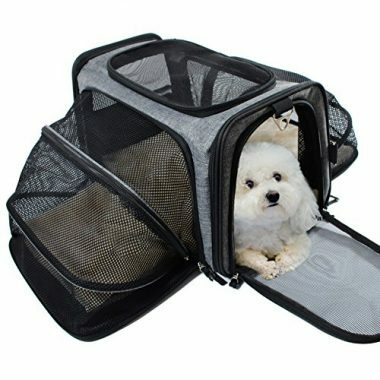 Like many of the items on our list, with this carrier pets benefit from ventilation thanks to mesh sides. Owners report that the pack provides their furry friends with ample leg room, and keeps them secure – perfect for cyclists as well as motorcycle owners! 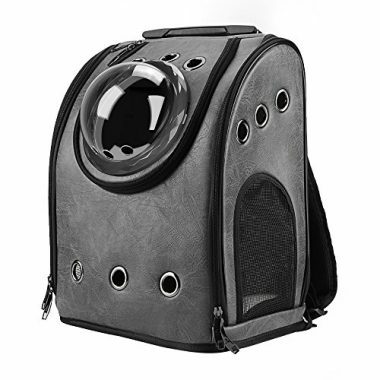 If you’re looking for motorcycle pet carriers for small dogs, Texsens’ unique ‘bubble’ backpack could be just the thing. The carrier is worn like a backpack and allows pets to peek out into the world with a built-in ‘window’ – a hemisphere of durable transparent plastic. This allows cats and smaller dogs to enjoy the view without being exposed to the elements and means they won’t need goggles on speedier journeys. The bubble can also be replaced with a mesh cover. The backpack distributes pets’ weight evenly over your back and shoulders, making it comfortable to carry, whilst keeping your hands free. It’s the perfect option for keeping your small pet comfortable as you pop to the shop or visit the vet’s, as well as being an ideal solution for motorbike rides. Pet Ego’s pet carrier is truly multifunctional. It can be securely attached to your motorcycle, but also be worn as a shoulder bag or backpack. However you choose to use this carrier, you can rest assured your pet will be comfortable, thanks to its mesh sides and waterproof coating. A padded inner layer offers an additional layer of comfort, too. The carrier is resistant to UV radiation, so it can stand up to plenty of sun exposure without becoming damaged. Finally, it’s airline approved, so you really can take your best friend with you wherever you go. Journey with your pet to just about anywhere, with Saddlemen’s pet carrier kit. As well as being a great motorcycle pet carrier, this device can be used to take pets just about anywhere. Multiple vents give your pet plenty of fresh air as they ride along, whilst access flaps make getting them in and out incredibly easy. Thanks to the carrier’s spacious size, small and medium-sized dogs will have plenty of room to stretch out, relax, and enjoy the journey. The carrier even has built-in food and water trays! Most importantly, though, the carrier can be secured to your motorcycle with complete security, through its adjustable bar strap system. With this, it can be attached the motorcycle’s seat, luggage rack, or sissy bar. For pets with a flair for fashion, this carrier is the perfect fit. 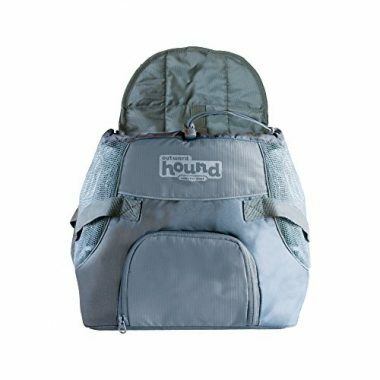 Your pooch will love riding in this back-pack style carrier. 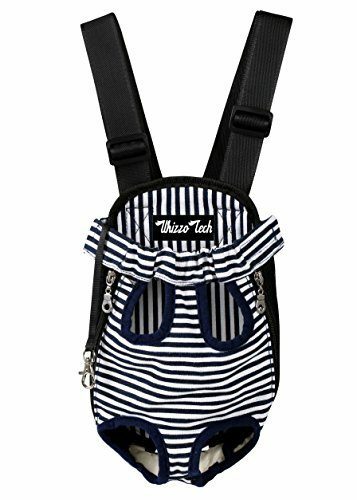 Available in three sizes and five attractive designs, this carrier keeps dogs secure with a comfortable but strong harness system. It’s easy to take pets in and out of the carrier, thanks to a system of elastic and zips. The breathable mesh sides also keep pets cool and allow them to enjoy the breeze. The durable fabric is easy to care for since you can simply pop it in the wash when it becomes dirty. Owners say that this carrier is a great fit for pooches, and distributed their weight evenly to avoid damage to the back. 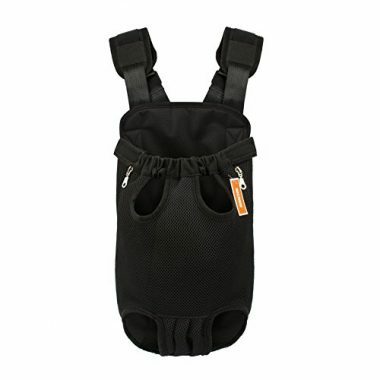 For the sportier owners and pets among you, there’s K9’s Sport Sack. This backpack style dog carrier keeps pets secure with ease, with its elasticated harness system and collar clip. Dogs face forward and enjoy the view, whilst you keep your hands free, safe in the knowledge that your pet won’t come tumbling out. As well as being a great solution for motorcycle-riding canines, this carrier can keep dogs secure on hikes, on bikes, whilst skiing, or even just walking to the shops. Mesh sides ensure your dog has proper ventilation; a variety of attractive colours ensure they stay stylish. 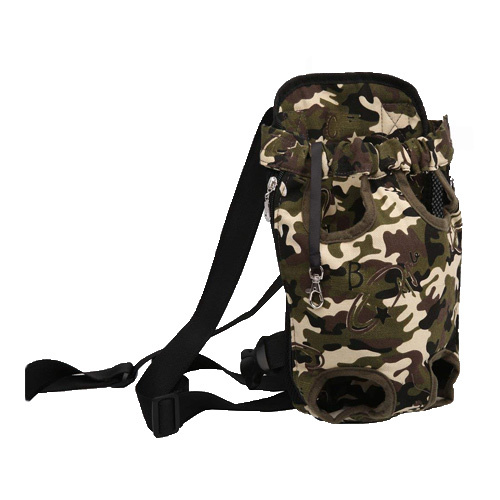 For pets who don’t like being on display, this camouflage style carrier is the perfect option. 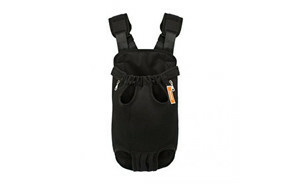 The harness style carrier is worn on the front, much like a baby carrier, and keeps dogs comfortably in place. 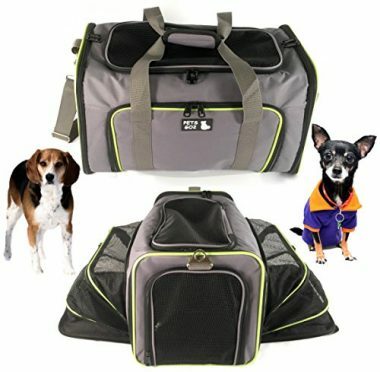 Owners report that they, and their furry friends, can travel in comfort and style with this carrier. The durable polyester fabric is also tough enough to stand up to frequent use, but soft enough to keep pets comfortable. This is one of the most affordable carriers on the list too – keeping your dog safe and comfortable doesn’t have to cost the earth. These ten carriers represent what we believe are the best on the market right now, and we hope there’s something here to meet every need. However, all dogs are different, and which carrier you choose will depend on a variety of factors. With this in mind, we’ve put together a handy buying guide, helping you to find the carrier that’s best for you. 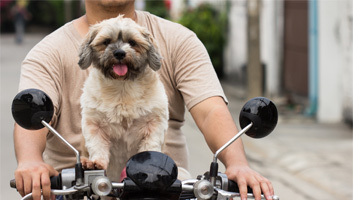 Because taking dogs on motorcycles can be a risky business, we’ve also collected some top tips for ensuring that your pooch stays as safe as possible when they’re on the road. Most motorcycle dog carriers are available in a variety of sizes. However, generally speaking, only small and medium-sized dogs can be safely transported this way. A large dog carrier for motorcycles is usually more of a second seat – or even a sidecar! These can be costly but are the safest option for biking with larger breeds. We wouldn’t recommend using one of the carriers on this list for larger dogs. In an enclosed carrier they may be too cramped, causing unnecessary pain and stress, whilst the harness style carriers can throw your back or your balance when heavier pooches are introduced. If you’re planning a long road trip, we’d recommend choosing an enclosed carrier. This ensures they aren’t exposed to intense winds for long periods of time, and gives them a bit more room to stretch out. These carriers can also be really useful for any ongoing journeys, as many are consciously made in airline-approved sizes. For shorter journeys, on the other hand, carrying your pet in a harness may make more sense. These carriers allow your canine companion to enjoy the view and stay safe by your side as you hop on and off. They also take up less storage room! 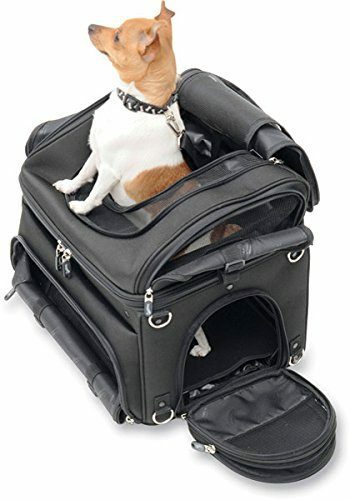 Whether you’re looking for a Harley Davidson pet carrier, or a scooter dog carrier, most types of the motorcycle can accommodate small to medium sized pooches safely. With a larger vehicle, you’ll have more room to dedicate to your pet, so we’d recommend a carrier which can be attached to the bike rather than to your body. On smaller vehicles, the opposite is usually true, and it will probably make more sense to carry your dog in a back-pack or front-facing carrier. In these carriers, dogs rest on your back, usually in a harness. This keeps dogs out of the way whilst you’re driving, but doesn’t allow you to keep an eye on them. For this reason, backpack style carries are usually better suited to pets who are used to travel and can be trusted to stay calm without seeing your face. With front carriers, your dog is held against your stomach and chest – in much the same configuration as some baby carriers use. This style of the carrier allows you to keep a closer eye on your pet, but with larger animals, you may find that the positioning impedes your driving ability. Whilst front and backpack-style carriers are great for hiking and biking, enclosed carriers tend to be even more versatile. Enclosed carriers are usually attached to the motorcycle itself rather than your body, making long journeys with your dog more comfortable, since you don’t need to bear their weight yourself. Only put a carrier through the washing machine if it’s advertised as machine washable, and try not to do so too often. Being exposed to high temperatures on a regular basis could weaken the carrier. Store the carrier somewhere safe, where it’s unlikely to become torn. Avoiding exposure to light during storage is also a good idea, as UV radiation can eventually damage the fabric. Always replace a dog carrier as soon as you’re no longer sure it’s fit for purpose. If a carrier were to fail during a journey, your dog could become seriously injured or worse, so the risk is never worth it. Q: Do dogs like riding on motorcycles? A: Every dog is different, but lots enjoy the sensation of riding alongside their owners on a two-wheeled adventure. Many pooches enjoy the companionship of a shared ride, whilst others enjoy the stimulating views and all the scents rushing their way – this is the main reason why dogs love dangling their heads out of car windows. Make sure you introduce your dog to riding the motorcycle slowly, simply sitting on the bike at first, and gradually building up the length and speed of your journeys. It’s also a good idea to get dogs used to being in their carrier before using it in tandem with the bike. You will soon be able to work out whether your dog is a natural rider or better off in the car! We wouldn’t recommend riding with skittish or aggressive dogs, as they may find the experience too stressful, or cause problems during the ride. By working up to riding with your dog slowly, providing them with lots of reassurance on the way, you can minimise the possibility that they become stressed by this mode of travel. Q: What size dog can ride in a motorcycle dog carrier? A: With the right equipment, and the sized dog can share a motorcycle ride. However, for larger breeds, the best option is a sidecar or modified seat, and the carriers on this list are not suitable. The majority of small and medium-sized dogs will find a comfortable fit in one of these carriers, which are usually recommended for dogs weighing up to 20 pounds or so. Make sure to check the manufacturer’s instructions so as not to overload the carrier, as this could result in it not functioning correctly. Q: Are motorcycle dog carriers safe to use? A: Motorcycle travel will always be a little riskier than other forms of transport but provided you drive safely and your dog is secure and calm, a carrier is a great way to maximise safety for you both. When travelling with your dog, stop for regular breaks. Dogs are far less likely to become stressed when they are comfortable, having had the opportunity to stretch out and relieve themselves. For us, the best dog motorcycle carrier on the market right now has to be Outward Hound’s PoochPouch. This charmingly named carrier is an easy, affordable, and effective way to keep your dog safe during trips on your bike. Despite being light-weight, its durable fabric helps protect your pooch against bumping and rattling on the road. Its carefully designed harness system is also great for keeping your dog secure, and with them riding on your front, it’s easy to keep an eye on them. Overall, the PoochPouch is a clever solution to what can be a tricky dilemma – keeping your dog safe on the road, and all without spoiling their view!